Dramatic light on Carrie Furnace taken with cell phone from The Rivers of Steel Pumphouse Lot. and a groundhog I disturbed while photographing the sign. The Monongahela River looked chilly. Yes it was Amy. Thanks. Great pictures! Signs of Pittsburgh past. Thanks for your thoughtful comments and for sharing your experience in the steel mills. I’m glad the photos evoke great memories. This is a great collection of Carrie Furnace photos and the ground hog. Ken’s comments resonate with me as my extended family income revolved around the steel mills in Shenango Valley. 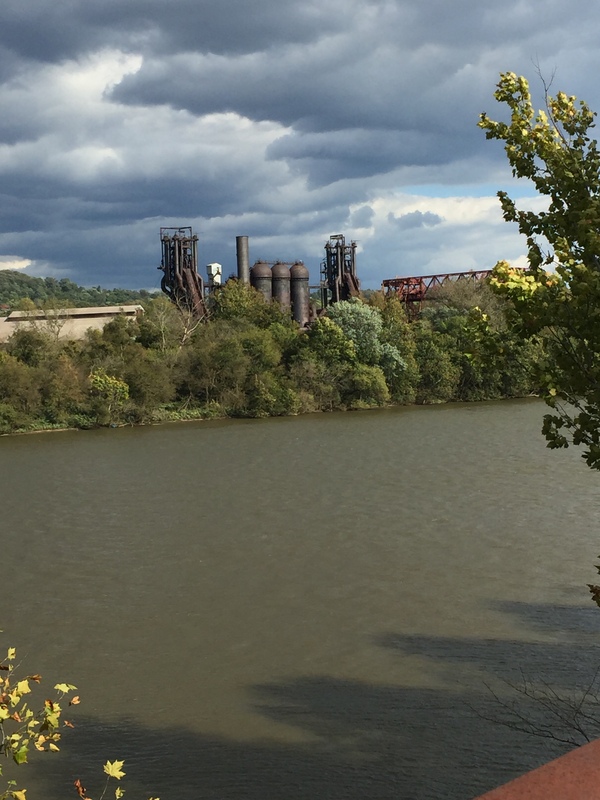 I love the photo of the Carrie Furnace surrounded by a stormy sky. Very good shots! Cloudy with the sun shining on each one! Ah, the light, what we look for when we photograph. And when you’re gifted with that ideal light, oh, the joy. Those are some serious clouds.